British Red Cross is a volunteer-led humanitarian organisation that helps people in crisis. They enable vulnerable people at home and overseas to prepare for and respond to emergencies in their own communities. When the crisis is over, they help people recover and move on with their lives. NEF Consulting conducted a socio-economic analysis for British Red Cross on the case studies of five people who had recently been supported by their staff and volunteers. The studies show the value of time-limited practical and emotional support that responds to people’s individual needs and wishes at times of transition and vulnerability. 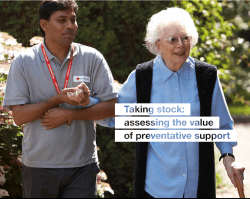 As it is increasingly important to be able to show how preventative services deliver savings for statutory partners, they asked NEF Consulting to support them in evaluating these savings through independent economic analysis . They assessed the costs which could have been incurred by the state to treat and deliver care to these five people had the British Red Cross services not been there. The estimated savings were between £700 and £10,430 per person. This reflects a minimum return on investment of over three and a half times the cost of the service, and in most cases significantly more.